Waterproofing projects, which that are not under direct hydrostatic pressure for example. These are known as ‘tanking slurries’ and include the BBA Approved, SikaTop Seal 107 tanking slurry and Remmers Profi-Tight tanking slurry. These are normally applied with a ‘slurry brush’ or toothed trowel in 1 – 3 coats according to the specified waterproofing requirements. The second and third coats may be spray applied in some situations – please call any of our offices for advice on this aspect. There are still traditional bitumen tanking systems and polymer modified bitumen tanking systems available, but due to their bitumen content the smell is not generally considered suitable for internal use, even the water based bitumen emulsion types. They are however widely used for externally applied waterproof tanking and particularly in new construction works. For example Remmers Profi-Tight bitumen based tanking system. A particular advantage of tanking systems is that they can be used on different substrates such as concrete, brickwork, natural stone etc. Therefore they can create a uniform substrate for the application of additional vapour tight or decorative finishes as required. Basement tanking systems are therefore extensively used for basement and below ground structural waterproofing in accordance with BS 8102: 2009. Type A: Barrier Protection, in both new construction and in refurbishment waterproofing works). 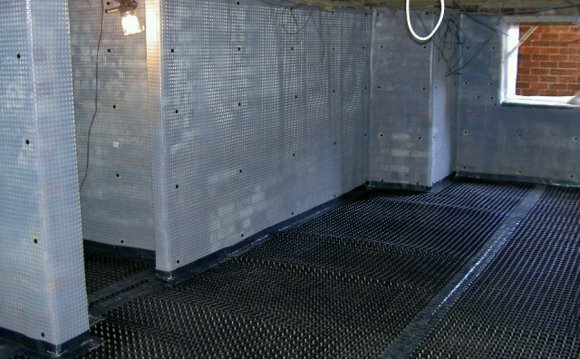 Tanking systems are now the most widely used and well proven basement waterproofing solutions in refurbishment situations and also for both the new and refurbishment of lift-pits. The installation of cement based multi-coat renders, mortars and coatings should, be left until as much as practicable of the structure and therefore its dead load has been built / installed to avoid subsequent settlement or cracking in the system. The concrete, brickwork, render or stone substrate should be prepared to provide a key for the tanking system (liquid, slurry, render or mortar based products), with an open textured surface and pore structure in accordance with the relevant Product Data Sheet (PDS) prior to application of the system. Application can be by trowel, brush or spray, according to the specific products nature and function. Details on application methods and rates, mixing, the number of layers/coats and curing requirements can vary quite considerably between different products and systems, so please contact any NCC Basement Waterproofing Site office for detailed information and advice for your specific waterproofing project. Any movement or expansion joints in the structure must be brought through the tanking system and a suitable watertight jointing system incorporated into the waterproof tanking system. The ideal jointing solution for this requirement is the well proven SikaDur Combiflex system, which combines durable elastic membrane strips with extremely high bond strength structural epoxy resin (SikaDur 31), which bonds it to the substrate on both sides of the joint – even over wide and two dimensionally moving cracks. The jointing system is applied prior to the rest of the basement tanking render systems, where the adhesive also provides the ideal key for the built-up tanking system (such as the Sika 1 Pre-bagged Tanking System). We are actively involved in waterproof basement tanking projects all over the UK, every single day of the year. Indeed we have been doing this as a core business activity now for over 30 years. Take advantage of our practical experience and technical expertise with FREE independent advice from the NCC Basement Waterproofing Site specialists. If you would like support and advice in selecting the most appropriate materials and waterproofing contractors for your basement tanking requirements, you can contact any NCC Basement Waterproofing Site office to receive FREE unbiased, independent advice, plus the best prices and fast delivery of the most appropriate tanking solutions for your project!